Finally, amidst fifty people squeezed in the small room, I came face to face with him and smiled vainly. I had one shot at striking a meaningful conversation with him. It was not fair! "Which form of martial arts do you learn?" I quipped. He jumped with delight. He looked at me half expectantly and said "Wing Tsun, it’s a quaint form of kung fu, not many people have heard of it... (suddenly his eyes twinkled) do you learn martial arts?" My heart skipped a beat, we were learning the same form of martial arts and both of us were passionate about it. He insisted we compare how it was being taught to us and suddenly, the space was cleared for us to practice 'siu nim tao' form, 'chi sao', and chain punching. I was gleaming with delight. As we finally started 'talking', with sweat pouring down our foreheads and the crowd gathering around us again, he shared anecdotes and stories about his work, his life and his art. He couldn't hope for a more eager crowd. Finally, almost an hour later, his manager grumbled and requested us to leave so he could wind up and sleep. What is remarkable about this experience is the lesson it unassumingly taught. It acted as a subtle reminder about the complexity of thinking and approaching the Arts world. Transposing this experience into the learning curve, I realized that the humanness of an artist must not be lost when interviewing him or writing a story about his work. An artist draws inspiration from real life experiences and activities. 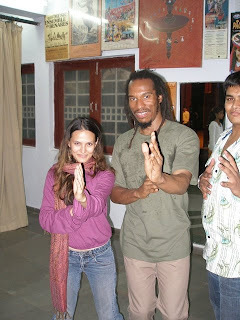 Zephaniah's art of writing for example, is also influenced by Kung Fu. The balance and the fluidity present in his work are characteristics of both art forms however, it does not imply that it is the only influence. There is more to the lines drawn or written by an artist than meets the eye, and simplistic reasoning cannot even begin to account for it. As humans, we constantly make connections with the world around us. This ability to relate to things, identify interdisciplinary relationships and gain a holistic picture is essential for any art journalist. A response to a work of art is about having a conversation with that piece of art, the artists and the context in which it is anchored. It is about connecting.